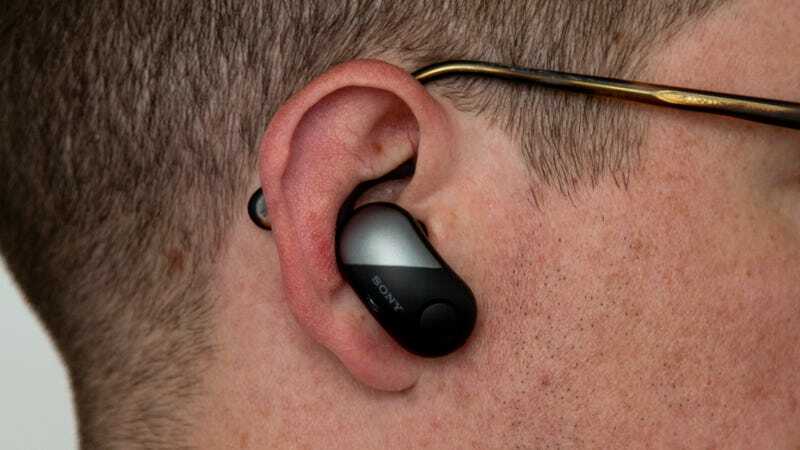 The new £180 Sony WF-SP700N earbuds look great. 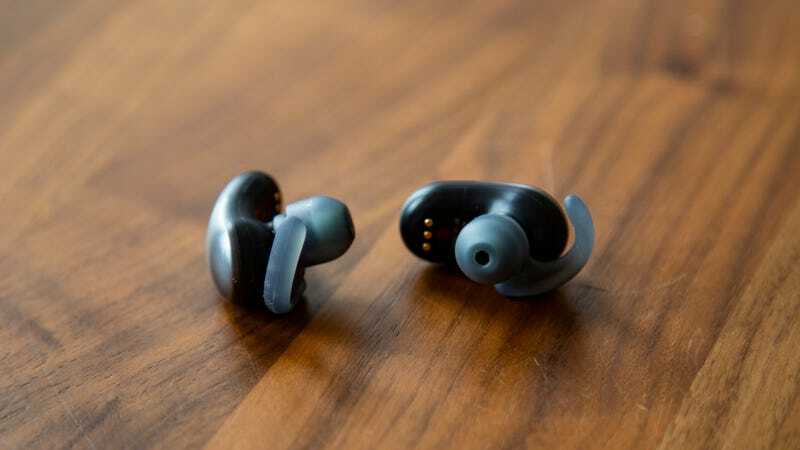 Unlike a lot of unwieldy competitors, these truly wireless buds sit flush against your head and follow the curve of your ear when properly worn. So even though the earbuds themselves are a little bit bulky—each earbud is roughly the size of two pieces of popcorn—I forgot I was wearing them after a few minutes. This is a big deal because I can’t say the same about my other favourite truly wireless earbuds: the Bose SoundSport Free. Those buds seem to dangle dangerously in my ear and don’t work great on runs. 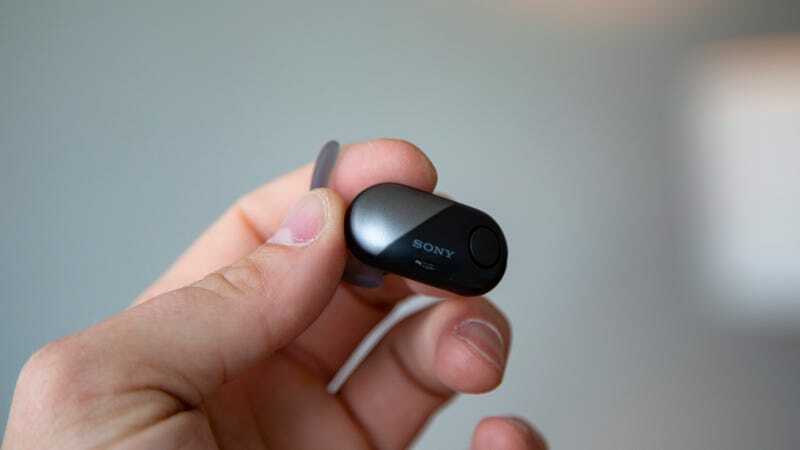 The new Sony sports buds are also vastly more secure than the Sony WF-1000X that I reviewed last year. As far as features go, the new WF-SP700N sport earbuds are very similar to the WF-1000X buds. (Yes, I know that Sony’s model names are awful and confusing.) Like last year’s street-friendly model, the new sports buds come with adjustable noise-cancelling technology that’s supposed to silence the outside world when it’s cranked all the way up or let in just enough noise when it’s in ambient mode. You control the feature with a tiny button on the left earbud. There’s also a little button on the right earbud that lets you play or pause, change tracks, and beckon your voice assistant of choice. Unlike the WF-1000X, the new WF-SP700N offer an IPX4 water resistance rating and a new design that keeps the buds firmly in your ears when your bouncing about getting your exercise. While I love a water resistant gadget as much as anyone, the fit thing is a huge deal for me. It’s not just that the WF-SP700N are comfortable. They’re secure as hell. Once I got the sizing right with the included extra grippy eartips and wings, it didn’t matter how much I shook my head or thrashed about. The earbuds stayed put. This is a big deal if you’re worried about a bud popping out on the street and falling in the storm drain. It’s an arguably bigger deal if you’re annoyed when an earbud becomes dislodged on a regular run. Neither of these scenarios seemed like threatening in my testing, though. The buds just locked into place and stayed there. If it seems like I keep circling back to fit and comfort, that’s because these are the most important details of any truly wireless earbud experience. The audio quality on the WF-SP700N earbuds is very decent, for instance. They come with Sony’s famous Extra Bass feature, which does make a difference if you love lower frequencies. If you’re really looking for high fidelity in a set of headphones, however, go get a set of over-the-ear Bowers & Wilkins headphones — though I definitely wouldn’t recommend taking those on a run in the woods. 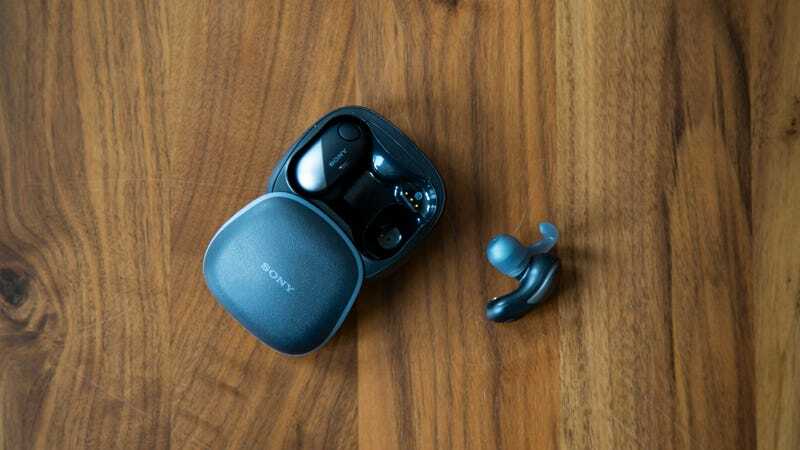 Meanwhile, the noise cancelling on the WF-SP700N earbuds is noticeable, if you want the best noise cancelling, try the Sony WH-1000XM2 headset. But if you want the best fit and comfort for doing active things in a world without wires, I have to recommend the new WF-SP700N. Unfortunately, things go downhill from here. The battery life on the WF-SP700N is noticeably bad. Sony says you get three hours per charge and two charges when the earbuds are in the charging case. Even when I felt like I was good about putting the buds in the case when I wasn’t using them, though, I typically found myself with dead earbuds about every other day. Turning off the noise-cancellation feature would extend the battery life a bit, but I really liked the noise-cancellation feature, so I didn’t do this. For what it’s worth, I did become more conscientious about charging the damn things, after being left without earbuds a few times. My other gripe involves connectivity. It’s not that the WF-SP700N earbuds were annoying to connect, and it’s not that they didn’t stay connected to my phone. I actually had a hard time knowing when I had to connect or reconnect. If I pulled the earbuds out for a few minutes, for example, I could put them back in, hit the play button, and continue listening to my yacht rock playlist. If it had been more than a few minutes—I have no idea exactly how long—the earbuds would have turned themselves off which meant I’d check the Bluetooth connection, then realise the earbuds were off, and then turn them back on. And then, only the left earbud would turn on, so I’d have to turn on the right earbud. (This is actually a feature as Sony designed the earbuds to be independent so you could use just one.) And then, if I walked down a busy street, the audio would sometimes bounce back and forth between the right earbud and the left. A lot of truly wireless earbuds do this. That doesn’t make it any less annoying with the new Sony’s, though. To be honest, though, trouble battery life and connectivity stuff is pretty common with truly wireless earbuds. Like I said at the outset, no company has completely figured out how to make the perfect truly wireless earbuds. But with the WF-SP700N, Sony is getting delightfully close.